For the past six years, the versatile singer had his hand in everything from songwriting to pursuing a musical theatre career, except for filling an album only with his voice. And for his ever first solo album “Canvas,” Leo of Vixx transformed himself into a meticulous artist and splashed a blank canvas with colors only the artist himself could create. 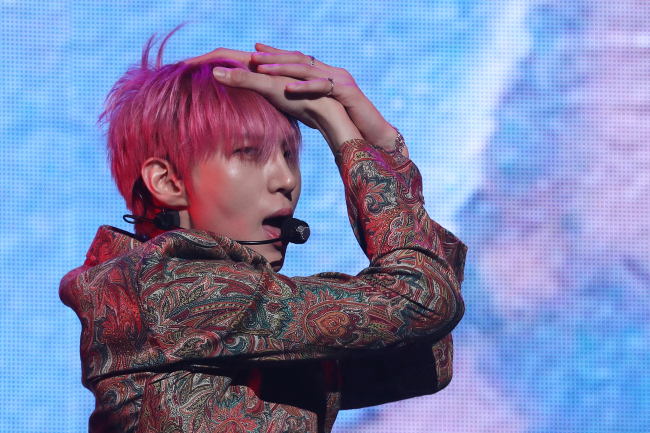 The seven-track album is led by lead track “Touch & Sketch,” a groovy bass-driven song that bounces between the digitized beat and Leo’s clear breathy vocals. It holds a double meaning, describing both the physical act of touching and an artistic “touch” in drawing. “This album is a self-reflective album, through which I could see a whole process of my development as well,” said Leo during a media showcase for “Canvas” in Seoul on Tuesday. A soccer player in his high school years, Leo shared that he started pursuing a K-pop career after watching singer Hweesung perform. Leo, who has a strong edge in ballads, explained that ballad “Dream” is a song that will provoke listeners to look back on their past. Having debuted as a member of Vixx in 2012, Leo has been making his name known in the K-pop scene as a songwriter. For the band, he wrote songs like “On a Cold Night,” “Shadow,” “Moonlight” and “Romance of Over,” as well as songs of the group’s subunit Vixx LR, such as “Beautiful Night” and “Feeling.” The singer, also well known for his signature high-pitched vocal prowess, expanded his career into musical theater by starring in musicals “Full House” in 2014 and “Mata Hari” in 2016. Leo is set to hold his first solo concert at the Blue Square in Hannam-dong, central Seoul, from Aug. 31 to Sept. 2.